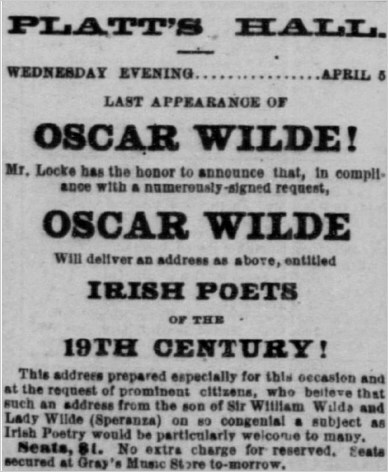 On that occasion Wilde was called upon to give only an impromptu speech, and he talked in general terms about Irish achievement and how the English occupation had arrested, but not dimmed, the development of Irish art. 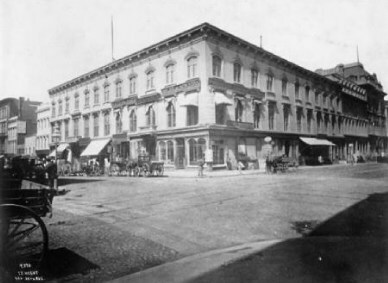 Now in San Francisco he created a full lecture , in which he focused on an aspect of the arts closer to his knowledge and his mother’s heart: nineteenth century Irish poetry. 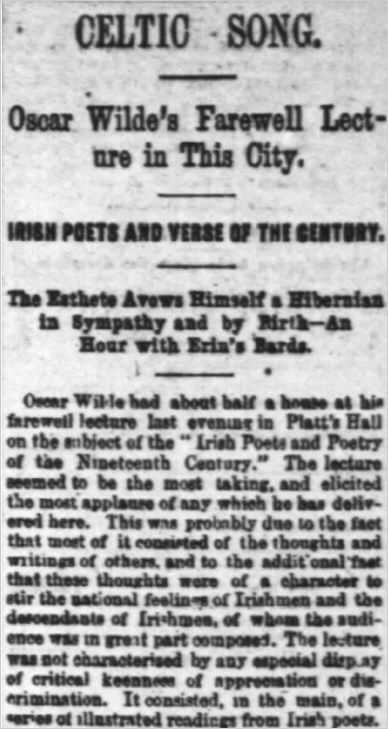 Wilde began his lecture by noting how the English conquest had destroyed the development of art in Ireland—but he reassured his listeners that the Celtic spirit could not die. It was, he said, the stuff of legends and romance, and a basis for politics and liberty. For his generalizations on style and rhyme, and occasionally for his selections, Wilde relied heavily on Matthew Arnold’s six-part essay On the study of Celtic literature (1867). Indeed, he quotes Arnold directly on MacPherson’s Ossian. A Wednesday. Easter Sunday in 1882 was on April 9th. Wilde scholars can be extremely grateful to Robert D. Pepper for his work in documenting this lecture. Much of the information on this page is taken from his Oscar Wilde, Irish Poets and Poetry of the Nineteenth Century’. Edited from Wilde’s Manuscript and Reconstructed, in part, from Contemporary Newspaper Accounts, with an Introduction and Biographical Notes (Book Club of California, 1972). GREAT BLOG AND ARTICLE WITH GREAT LINKS TO IRISH NATIONALIST POETS OF DAYS GONE BY ! The newspaper review at the top seems typical of much of the bad, predjudicial press Wilde received during his tour. Very nasty. Look at that list of poets! Not bad for a people whose culture had been supposedly wiped out (nearly) by the Sassenach. And look at the poets to come! Wilde might have quoted with justification from his own Poems, published in 1881. He found great hostility in America and in Europe but what a trooper he was. He also found kindness in such people as Julia Ward Howe.